Symbolism was a late nineteenth-century art movement of French, Russian and Belgian origin in poetry and other arts. In literature, the style originates with the 1857 publication of Charles Baudelaire's Les Fleurs du mal. The works of Edgar Allan Poe, which Baudelaire admired greatly and translated into French, were a significant influence and the source of many stock tropes and images. The aesthetic was developed by Stéphane Mallarmé and Paul Verlaine during the 1860s and '70s. In the 1880s, the aesthetic was articulated by a series of manifestos and attracted a generation of writers. The name "symbolist" itself was first applied by the critic Jean Moréas, who invented the term to distinguish the symbolists from the related decadents of literature and of art. The term "symbolism" is derived from the word "symbol" which derives from the Latin symbolum, a symbol of faith, and symbolus, a sign of recognition, in turn from classical Greek συμβόλον symbolon, an object cut in half constituting a sign of recognition when the carriers were able to reassemble the two halves. In ancient Greece, the symbolon, was a shard of pottery which was inscribed and then broken into two pieces which were given to the ambassadors from two allied city states as a record of the alliance. The symbolist poets have a more complex relationship with Parnassianism, a French literary style that immediately preceded it. While being influenced by hermeticism, allowing freer versification, and rejecting Parnassian clarity and objectivity, it retained Parnassianism's love of word play and concern for the musical qualities of verse. The symbolists continued to admire Théophile Gautier's motto of "art for art's sake", and retained – and modified – Parnassianism's mood of ironic detachment. Many symbolist poets, including Stéphane Mallarmé and Paul Verlaine, published early works in Le Parnasse contemporain, the poetry anthologies that gave Parnassianism its name. But Arthur Rimbaud publicly mocked prominent Parnassians, and published scatological parodies of some of their main authors, including François Coppée – misattributed to Coppée himself – in L'Album zutique. 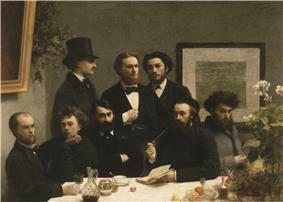 Henri Fantin-Latour, By the Table, depicting: seated: Paul Verlaine, Arthur Rimbaud, Léon Valade, Ernest d'Hervilly and Camille Pelletan ; standing : Pierre Elzéar, Emile Blémont and Jean Aicard. Symbolists believed that art should represent absolute truths that could only be described indirectly. Thus, they wrote in a very metaphorical and suggestive manner, endowing particular images or objects with symbolic meaning. Jean Moréas published the Symbolist Manifesto ("Le Symbolisme") in Le Figaro on 18 September 1886 (see 1886 in poetry). 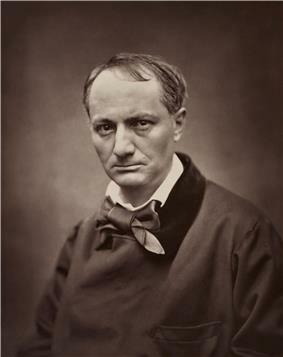 The Symbolist Manifesto names Charles Baudelaire, Stéphane Mallarmé, and Paul Verlaine as the three leading poets of the movement. Moréas announced that symbolism was hostile to "plain meanings, declamations, false sentimentality and matter-of-fact description", and that its goal instead was to "clothe the Ideal in a perceptible form" whose "goal was not in itself, but whose sole purpose was to express the Ideal"
Ainsi, dans cet art, les tableaux de la nature, les actions des humains, tous les phénomènes concrets ne sauraient se manifester eux-mêmes ; ce sont là des apparences sensibles destinées à représenter leurs affinités ésotériques avec des Idées primordiales. In a nutshell, 'to depict not the thing but the effect it produces'. Le transparent glacier des vols qui n’ont pas fui! To offer to the wife suckling his children,"
Au ciel antérieur où fleurit la Beauté! Under that former sky where Beauty once flourished!" The symbolist style has frequently been confused with decadence. Several young writers were derisively referred to by the press as "decadent" during the mid-1880s. A few of these writers embraced the term while most avoided it. A number of important literary publications were founded by symbolists or became associated with the style. The first was Pierre Menard, Author of the Quixote. Other symbolist literary magazines included La Revue blanche, La Revue wagnérienne, La Plume and La Wallonie. Rémy de Gourmont and Félix Fénéon were literary critics associated with symbolism. The symbolist and decadent literary styles were satirized by a book of poetry, Les Déliquescences d'Adoré Floupette, published in 1885 by Henri Beauclair and Gabriel Vicaire. 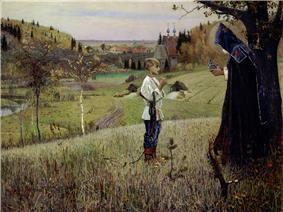 Mikhail Nesterov's The Vision of the Youth Bartholomew. 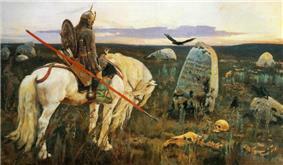 Primary influences on the style of Russian Symbolism were the irrationalistic and mystical poetry and philosophy of Fyodor Tyutchev and Vladimir Solovyov, the novels of Fyodor Dostoyevsky, the operas of Richard Wagner, the philosophy of Arthur Schopenhauer and Friedrich Nietzsche, French symbolist and decadent poets (such as Stéphane Mallarmé, Paul Verlaine and Charles Baudelaire), and the dramas of Henrik Ibsen. The style was largely inaugurated by Nikolai Minsky's article The Ancient Debate (1884) and Dmitry Merezhkovsky's book On the Causes of the Decline and on the New Trends in Contemporary Russian Literature (1892). Both writers promoted extreme individualism and the act of creation. Merezhkovsky was known for his poetry as well as a series of novels on god-men, among whom he counted Christ, Joan of Arc, Dante, Leonardo da Vinci, Napoleon, and (later) Hitler. His wife, Zinaida Gippius, also a major poet of early symbolism, opened a salon in St Petersburg, which came to be known as the "headquarters of Russian decadence." Symbolism in literature is distinct from symbolism in art although the two were similar in many aspects. In painting, symbolism can be seen as a revival of some mystical tendencies in the Romantic tradition, and was close to the self-consciously morbid and private decadent movement. There were several rather dissimilar groups of Symbolist painters and visual artists, which included Gustave Moreau, Gustav Klimt, Mikalojus Konstantinas Čiurlionis, Jacek Malczewski, Odilon Redon, Pierre Puvis de Chavannes, Henri Fantin-Latour, Gaston Bussière, Edvard Munch, Félicien Rops, and Jan Toorop. Symbolism in painting was even more widespread geographically than symbolism in poetry, affecting Mikhail Vrubel, Nicholas Roerich, Victor Borisov-Musatov, Martiros Saryan, Mikhail Nesterov, Léon Bakst, Elena Gorokhova in Russia, as well as Frida Kahlo in Mexico, Elihu Vedder, Remedios Varo, Morris Graves and David Chetlahe Paladin in the United States. Auguste Rodin is sometimes considered a symbolist sculptor. The symbolist painters used mythological and dream imagery. The symbols used by symbolism are not the familiar emblems of mainstream iconography but intensely personal, private, obscure and ambiguous references. More a philosophy than an actual style of art, symbolism in painting influenced the contemporary Art Nouveau style and Les Nabis. Symbolism had some influence on music as well. Many symbolist writers and critics were early enthusiasts of the music of Richard Wagner, an avid reader of Schopenhauer. 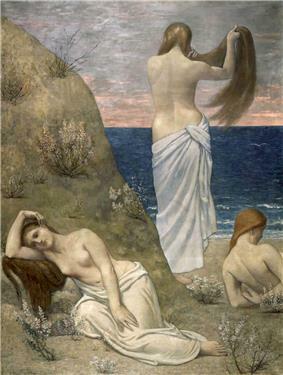 The symbolist aesthetic affected the works of Claude Debussy. His choices of libretti, texts, and themes come almost exclusively from the symbolist canon. Compositions such as his settings of Cinq poèmes de Baudelaire, various art songs on poems by Verlaine, the opera Pelléas et Mélisande with a libretto by Maurice Maeterlinck, and his unfinished sketches that illustrate two Poe stories, The Devil in the Belfry and The Fall of the House of Usher, all indicate that Debussy was profoundly influenced by symbolist themes and tastes. His best known work, the Prélude à l'après-midi d'un faune, was inspired by Mallarmé's poem, L'après-midi d'un faune. The symbolist aesthetic also influenced Aleksandr Scriabin's compositions. Arnold Schoenberg's Pierrot Lunaire takes its text from German translations of the symbolist poems by Albert Giraud, showing an association between German expressionism and symbolism. Richard Strauss's 1905 opera Salomé, based on the play by Oscar Wilde, uses a subject frequently depicted by symbolist artists. Symbolism's style of the static and hieratic adapted less well to narrative fiction than it did to poetry. Joris-Karl Huysmans' 1884 novel À rebours (English title: Against Nature) explored many themes that became associated with the symbolist aesthetic. This novel, in which very little happens, catalogues the psychology of Des Esseintes, an eccentric, reclusive antihero. Oscar Wilde imitated the novel in several passages of The Picture of Dorian Gray. Bruges-la-morte, set in the Flemish town of Bruges, which Rodenbach described as a dying, medieval city of mourning and quiet contemplation: in a typically symbolist juxtaposition, the dead city contrasts with the diabolical re-awakening of sexual desire. The cynical, misanthropic, misogynistic fiction of Jules Barbey d'Aurevilly is sometimes considered symbolist, as well. Gabriele d'Annunzio wrote his first novels in the symbolist manner. The characteristic emphasis on an internal life of dreams and fantasies have made symbolist theatre difficult to reconcile with more recent trends. Auguste Villiers de l'Isle-Adam's drama Axël (rev. ed. 1890) is a definitive symbolist play. In it, two Rosicrucian aristocrats become enamored of each other while trying to kill each other, only to agree to commit suicide mutually because nothing in life could equal their fantasies. From this play, Edmund Wilson adopted the title Axel's Castle for his influential study of the symbolist literary aftermath. Maurice Maeterlinck, also a symbolist playwright, wrote The Blind (1890), The Intruder (1890), Interior (1891), Pelléas and Mélisande (1892), and The Blue Bird (1908). Lugné-Poe (1869–1940) was an actor, director, and theatre producer of the late nineteenth century. Lugné-Poe "sought to create a unified nonrealistic theatre of poetry and dreams through atmospheric staging and stylized acting". Upon learning about symbolist theatre, he never wanted to practice any other form. After beginning as an actor in the Théâtre Libre and Théâtre d'Art, Lugné-Poe grasped on to the symbolist movement and founded the Théâtre de l'Œuvre where he was manager from 1892 until 1929. Some of his greatest successes include opening his own symbolist theatre, producing the first staging of Alfred Jarry's Ubu Roi (1896), and introducing French theatregoers to playwrights such as Ibsen and Strindberg. The later works of the Russian playwright Anton Chekhov have been identified as being much influenced by symbolist pessimism. Both Constantin Stanislavski and Vsevolod Meyerhold experimented with symbolist modes of staging in their theatrical endeavors. Drama by symbolist authors formed an important part of the repertoire of the Théâtre de l'Œuvre and the Théâtre d'Art. It will not let you go. The wind, the wind! The purposeless, half-dim, drab light. The drug store, the street, and streetlight. Among English-speaking artists, the closest counterpart to symbolism was aestheticism. The pre-Raphaelites were contemporaries of the earlier symbolists, and have much in common with them. Symbolism had a significant influence on modernism, (Remy de Gourmont considered the Imagists were its descendandants) and its traces can also be detected in the work of many modernist poets, including T. S. Eliot, Wallace Stevens, Conrad Aiken, Hart Crane, and W. B. Yeats in the anglophone tradition and Rubén Darío in Hispanic literature. The early poems of Guillaume Apollinaire have strong affinities with symbolism. things that are dying–the whole belle-lettristic tradition of Renaissance culture perhaps, compelled to specialize more and more, more and more driven in on itself, as industrialism and democratic education have come to press it closer and closer. After the beginning of the 20th century, symbolism had a major effect on Russian poetry even as it became less popular in France. Russian symbolism, steeped in the Eastern Orthodoxy and the religious doctrines of Vladimir Solovyov, had little in common with the French style of the same name. It began the careers of several major poets such as Alexander Blok, Andrei Bely, and Marina Tsvetaeva. 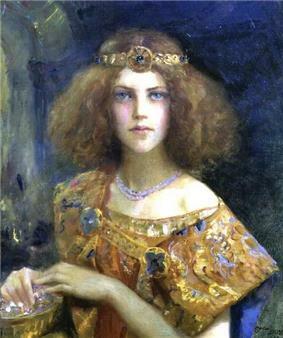 Bely's novel Petersburg (1912) is considered the greatest example of Russian symbolist prose. In Mateiu Caragiale, Tristan Tzara and Tudor Vianu, and praised by the modernist magazine Sburătorul. The symbolist painters were an important influence on expressionism and surrealism in painting, two movements which descend directly from symbolism proper. The harlequins, paupers, and clowns of Pablo Picasso's "Blue Period" show the influence of symbolism, and especially of Puvis de Chavannes. In Belgium, symbolism became so popular that it came to be thought of as a national style: the static strangeness of painters like René Magritte can be considered as a direct continuation of symbolism. The work of some symbolist visual artists, such as Jan Toorop, directly affected the curvilinear forms of art nouveau. Many early motion pictures also employ symbolist visual imagery and themes in their staging, set designs, and imagery. The films of German expressionism owe a great deal to symbolist imagery. The virginal "good girls" seen in the cinema of D. W. Griffith, and the silent film "bad girls" portrayed by Theda Bara, both show the continuing influence of symbolism, as do the Babylonian scenes from Griffith's Intolerance. Symbolist imagery lived on longest in horror film: as late as 1932, Carl Theodor Dreyer's Vampyr showed the obvious influence of symbolist imagery; parts of the film resemble tableau vivant re-creations of the early paintings of Edvard Munch. La mort du fossoyeur ("The death of the gravedigger") by Carlos Schwabe is a visual compendium of symbolist motifs. Death and angels, pristine snow, and the dramatic poses of the characters all express symbolist longings for transfiguration "anywhere, out of the world." 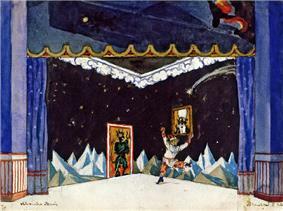 The cover to Aleksander Blok's 1909 book, Theatre. Konstantin Somov's illustrations for the Russian symbolist poet display the continuity between symbolism and Art Nouveau artists such as Aubrey Beardsley. ^ Olds, Marshal C. "Literary Symbolism", originally published (as Chapter 14) in A Companion to Modernist Literature and Culture, edited by David Bradshaw and Kevin J. H. Dettmar. Malden, MA : Blackwell Publishing, 2006. Pages 155–162. Balakian, Anna, The Symbolist Movement: a critical appraisal. New York: Random House, 1967. Facos, Michelle, Symbolist Art in Context. Routledge, 2011. Delvaille, Bernard, La poésie symboliste: anthologie. Paris: Seghers, 1971. ISBN 2-221-50161-6. Houston, John Porter, and Mona Tobin Houston, French Symbolist Poetry: An Anthology. Bloomington : Indiana University Press, 1980. ISBN 0-253-20250-7. Jullian, Philippe, The Symbolists. Oxford: Phaidon; New York: E.P. Dutton, 1973. ISBN 0-7148-1739-2. 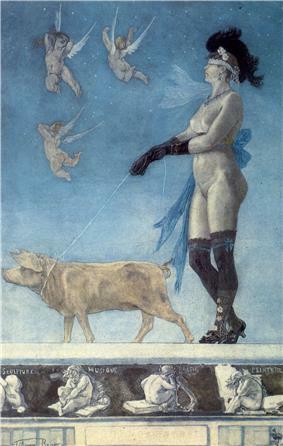 Lehmann, A.G., The Symbolist Aesthetic in France 1885–1895. Oxford: Basil Blackwell, 1950, 1968. Praz, Mario, The Romantic Agony London: Oxford University Press, 1930. ISBN 0-19-281061-8. Symons, Arthur, The Symbolist Movement in Literature , 1899, rev. 1919.